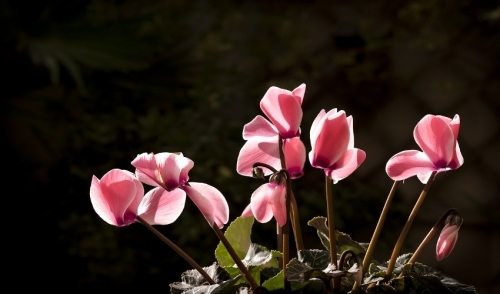 The Holiday Cacti or Cyclamen are great alternatives to the traditional poinsettia. These plants offer colorful holiday blooms, plus you can enjoy them all year 'round. The Holiday Cactus, also known as the Thanksgiving Cactus (Schlumbergera truncata) or the Christmas Cactus (Schlumbergera), can be bought during the holiday season already in bloom. It should sit in indirect sunlight, in regular indoor temperatures. Keep the soil moist and fertilize weekly. To get last year's cactus to bloom, leave it at night at temperatures around 55 degrees while the plant is beginning to flower. If you can't store them at that temperature, don't worry. They will flower with 12 to 13 hours of darkness each night. One trick is to lay black plastic over the plant when the lights are on. When you first purchase the plant, use a houseplant fertilizer once a week, taper off to once a month after a few weeks. Keep inside temperatures relatively cool. If that's impossible, at night, keep temps in the mid 40-50s. Provide non-direct bright light and be sure to keep the plants away from heat ducts and vents. When mature blooms begin to fade, try pulling off the flowers rather than cutting.